If you want to enjoy an addictive and one of a kind puzzle connecting game, you’re at the right place. Meet Dots Blob, the amazing cross-platform game that can challenge you to the fullest and give you hours of endless fun. 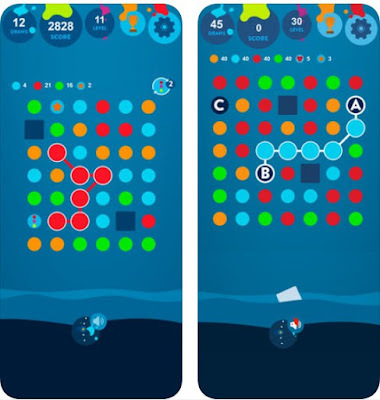 We’re so hooked up to Dots Blob that we’re sharing it with you as a Puzzle Game of the Week! You are probably wondering why should you download this game and what makes it so special and different from other puzzle connecting games. Yes, we all have come across some addicting puzzle connecting games on our devices, but Dots Blob is going to astonish you and give you an epic puzzle connecting game and hours of endless fun. You probably know the rules to the game; connect dots with the same colors without removing your finger from the touchscreen. You have got to have at least three dots that have matching colors, connecting them in different directions. The longer the line is that you draw, the more points you pick up and move on to the next challenge. So do you still think this is an easy puzzle game? Maybe you should try it out and see for yourself. overcome the challenges easier. You can download it now for free and challenge yourself to the max!